This ice cold drinks swooper flag, also called a feather banner, has a vibrant blue, green, and yellow color scheme. 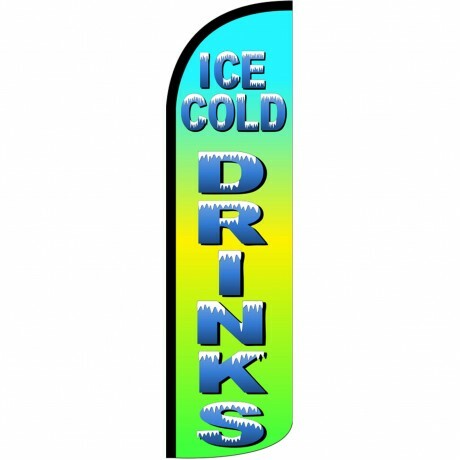 The message on the feather banner reads 'ICE COLD DRINKS', making this sign an ideal advertising banner. 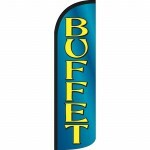 Each extra wide flag stands 12 feet tall and over 3 and a half feet wide. The feather banner's sheer size alone can be seen from afar and is more effective at reaching customers than other traditional signs. 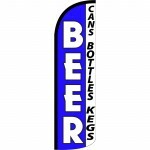 This swooper flag is constructed from UV treated, lightweight and affordable polyester, balancing quality and affordability. The graphics are imprinted using dye-sublimation for fade resistance. Each banner is has the imaged dyed-through; this means a mirror image of the graphic is visible from the reverse side. 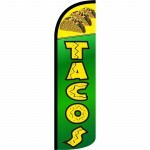 We recommend using the (SWFN-4SPD) heavy duty aluminum curved pole and (SWFN-SGS) steel spike to mount his fantastic HUGE advertising flag! (Pole and Spike Sold Separately) * Save money and buy a complete bundle!